Mori Seiki MR-1500G 20 ½” x 65” Geared Head Gap Bed Lathe s/n 3358 w/28-1350 RPM, Inch Threading, Tailstock, Steady and Follow Rests, 5C Collet Closer, 10” 3-Jaw Chuck, Mimik Hydraulic Tracer. Mori Seiki MS-850 17” x 36” Geared Head Gap Bed Lathe s/n 8712 w/ 32-1800 RPM, Inch Threading, Tailstock, Steady and Follow Rests, Trava-Dial, KDK Tool Post and Holders, 5C Collet Closer, 12” 4-Jaw Chuck, 6” 3-Jaw Chuck, 6” 2-Jaw Chuck. Traub A25 Automatic Screw Machine s/n 25-01852 w/ (2) Cross Slide Stations, (1) Drill Station. Programmable DRO, Shadow Point Locator, Surface and Profile Illumination. Officine Galileo Rockwell Hardness Tester. Brown & Sharpe 8” x 32” Bench Center. Obishi Keiki 12” x 16” Bench Center. (2)Sunnen PG-200E 1.5”-3” Finger Sets. (9)Sunnen Dial Bore Gages to 2”. Mitutoyo 6”-9” Dial Bore Gage. Mitutoyo and SPI Dial Bore Gages t0 2.5”. Brown & Sharp Hole-Test Bore Mics. Mitutoyo and Fowler Blade Mics to 4”. Deltronic Gage Pins and Sets. Starrett Crystal Pink 48” x 72” x 10” Grade “A” 2-Ledge Granite Surface Plate w/ Rolling Stand. (2)24” x 36” x 4” Granite Surface Plates w/ Cabinet Bases. Mojave 24” x 36” x 4” 2-Ledge Granite Surface Plate w/ Roller Stand. 24”x 36” x 6” Granite Surface Plate w/ Roller Stand. (2)18” x 24” x 4” 2-Ledge Granite Surface Plates. 8” x 12” x 2” Granite Surface Plate. Toyota mdl. 42-FGCU25 4900 Lb Cap LPG Forklift s/n 81906 w/ 3-Stage Mast @ 189” Lift Height. Material Racks and Misc Raw Materials. Mori Seiki SL-20 CNC Turning Center s/n 1712 w/ Fanuc MF-T6 Controls, Tool Presetter, 10-Station Turret, Hydraulic Tailstock, 8” 3-Jaw Power Chuck, 3J Collet Nose, 5C Collet Nose, Coolant. LNS Hydrobar Type 6.32HS-5.2 6-Tube Full Length Hydraulic Bar Feed s/n 27.111 w/ (6) Spindle Liners. Mori Seiki AL-2ATM CNC Turning Center s/n 1284 w/ Yasnac Controls, Tool Presetter, 12-Station Turret, Hydraulic Tailstock, Parts Chute, Chip Conveyor, 7” 3-Jaw Power Chuck, 5C Collet Nose, Coolant. LNS Hydrobar Type 6.32HS-5.2 6-Tube Full Length Hydraulic Bar Feed s/n 28.430 w/ (6) Spindle Liners. Hydraulic Tailstock, Parts Chute, Chip Conveyor, 7” 3-Jaw Power Chuck, 5C Collet Nose, Coolant. Mori Seiki SL-4A CNC Turning Center s/n 949 w/ Yasnac Controls, 10-Station Turret, Hydraulic Tailstock, Chip Conveyor, 11” 3-Jaw Power Chuck, Coolant. Lagun “Deluxe” Vertical Mill s/n 39124 w/ 2.2kW Motor, 58-4200 RPM, 40-Taper Spindle, Power Feed, 11” x 54” Table, Coolant. Mori Seiki MV-80 4-Axis CNC Vertical Machining Center s/n 1117 w/Fanuc System 6M Controls, 40- Station ATC, CAT-50 Taper Spindle, 31 ½” x 76 ½” Table, Chip Conveyor, Coolant. Mori Seiki MV-65 CNC Vertical Machining Center s/n 395 w/ Fanuc Series 10M Controls, 30-Station ATC, CAT-50 Taper Spindle, Hand Wheel, 25 ½” x 67” Table, Coolant. CAT-40 Taper Spindle, 20” x 43 ½” Table, Coolant. Sharp 2-Axis CNC Vertical Mill s/n 85090839 w/ Acu-Rite/Sharp CNC Controls, 3Hp Motor, 60-4500 Dial Change RPM, R8 Spindle, Chrome Ways, 10 ¼” x 51 ¼” Table. Amada HAD-250 10” Automatic Horizontal Band Saw s/n 250-200622 w/ Amada Controls, Hydraulic Clamping and Feed, Bundling Attachment, Coolant. Sullair 10-25 Rotary Screw Air Compressor w/ 58,397 Metered Hours. Speedaire 3-In-One Refrigerated Air Dryer. TDR / SRD Precision Drill Sharpener. (2)Baldor Pedestal Carbide Tool Grinders. Baldor 3/4Hp 8” Pedestal Grinder. Baldor and Delta Bench Grinders. Chicago Pneumatic mdl. CP625 Pneumatic Comression Riveter w/ 24” Throat and Stand. Birmingham mdl. DP-25 12-Speed Pedestal Drill Press. Duracraft mdl. DP-514 Bench Model Drill Press. Eagle mdl. BDP-50-50 Bench Model Drill Press. Media Tumbler w/ 12” x 31 ½” Tub. 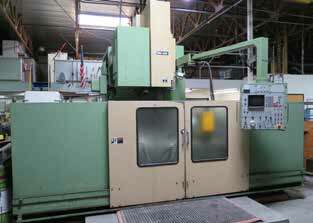 MMK Tecnara Type MD400R 4th Axis 16” Rotary Head. Haas 4th Axis 5C Rotary Head w/ Haas Servo Controller. Tapmatic, Procunier and SPI Tapping Heads. (8)Huot Drill and Tap Cabinets. Lista Wide 10-Drawer Tooling Cabinet. Lista 8-Drawer 2-Dool Storage Cabinet. Lista 7-Drawer Rolling Tooling Cabinet.